Robert Anae has been brought back as Brigham Young University's offensive coordinator after a several-year absence from the position. The facts that BYU&apos;s offense was an embarrassment this past season and that Bronco Mendenhall doesn&apos;t have a brain for offensive football led to Friday&apos;s curious news that Robert Anae will be returning as the Cougars&apos; offensive coordinator. Another factor: BYU must have had few options, unable to find and lure another offensive-minded coach, in the Cougar tradition, to come to Provo to rescue the phase of the game that boosted the program&apos;s profile under LaVell Edwards. Instead, the school lurched back for a retread, a coordinator who exited BYU at the end of 2010, after a season during which Anae stacked and lit the offense into a burning heap. Seared into memory is the way the attack that year stumbled through the Cougars&apos; first seven games, against more challenging opponents, when the team fell to 2-5, and the offense at that time spiraled downward to the bottom of national rankings in total offense, scoring offense, passing offense and passing efficiency. Remember, Anae had been a proponent and defender of BYU&apos;s ill-advised move to use two quarterbacks early that season, ineffectively splitting time between Riley Nelson and Jake Heaps. He spun the foolishness of that decision straight to the end, wholly missing the error in judgment, saying it was "the exact course to take." He also said: "There&apos;s bound to be a bunch of second-guessing when you&apos;re not successful. But there&apos;s no doubt in my mind that we did the right thing for our team." His certainty was flat-out odd. Even Mendenhall disagreed, admitting that splitting time was a mistake. Anae also struggled with his play-calling, sometimes concocting detailed plans for an upcoming opponent and then switching his emphasis at the last moment before a game. Other assistants on staff, as well as players, were frustrated and baffled by some of the coordinator&apos;s decisions. One knowledgeable assistant, asked after a loss about Anae&apos;s play-calling in critical situations, quietly shook his head in disapproval. Seasoned offensive leaders, such as John Beck and Max Hall, had the gravitas to intercede and alter some of Anae&apos;s spontaneous ideas and, under those QBs, BYU&apos;s offense flourished. But later, players who lacked that experience, heft and confidence suffered from them. The records the Cougars put up over the first few years with Anae were impressive. But when those veterans graduated, the success, especially against tougher teams, dried up. Equally problematic, Anae had a manner that was difficult for some in the program to handle. Many players disliked him. He had the charisma of a pile of bricks, the bearing of a glacial drift. He inspired his underlings with the heavy drag of a rack of blades turning soil hitched behind a plow horse. He was solemn and stubborn, not inspiring, and … let&apos;s just say communication skills weren&apos;t his strength. Now, he&apos;s back. Anybody in Provo thrilled with that? If they are, it&apos;s an indictment on and a desperate declaration regarding how stupid things got under Brandon Doman. Anae, who played on BYU&apos;s 1984 national championship team and was hired initially alongside Mendenhall by athletic director Tom Holmoe at the end of 2004, spent the past couple of seasons at Arizona as the offensive line coach. Maybe during that time he thought through and learned from some of his mistakes in Provo the first time around. Maybe he rounded out his game. He&apos;s an intelligent man, a good man. But can he effectively and consistently coordinate an offense? Can he inspire players to be better than they would be otherwise? Can he beat the better teams the Cougars will face in the seasons ahead, the way great BYU offensive minds of the past used to do? 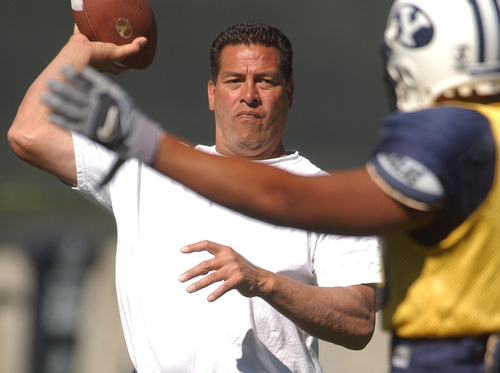 Back in 2005, at the start of his first fall camp as OC at BYU, Anae said he looked forward to regenerating the Cougars&apos; old ways: "This new offense that we&apos;re running right now originated here on this campus. It was LaVell&apos;s. I&apos;m excited to have the chance to bring this thing back to where it belongs  its home." Well. Welcome to Robert Anae&apos;s return. Look for him to have a firm grip on that offense, be it for the positive or the negative, separate and apart from Mendenhall, who has repeated over and over that he doesn&apos;t get offensive football, certainly not the way forward-thinking coaches did back in the old days. The Cougars had best hope Anae does. And that the mulligan he&apos;s been given turns out better than his first shank into the tall grass. Gordon Monson hosts "The Big Show" weekdays from 3-7 p.m. on 1280 AM and 97.5 FM The Zone. Twitter: @GordonMonson.